Weight gain: +7, I keep telling myself it's the baby growing but at this rate I'm a little nervous. Was pretty bad about the gym last week after working a 5 day work week for the first time in almost 2 years! But managed to go Sunday before work and this morning. Food aversions/cravings: nothing new. Excited for lots of delicious food in Eurpe though. Sleep: good, slept great last night. Overall feeling/other symptoms: for the most part great. The 2nd trimester is a breeze, so thankful we are traveling now. What we've been up to: Rollie's mom was here this past weekend for a quick visit. Mostly just getting ready for trip! Everyone is packed and the house is clean! I surprisingly packed pretty lightly (for me) my suitcase is mostly black & grey...with some fun jewlery and scarves...more of which I'm sure I'll buy of. Now just one more day of work. 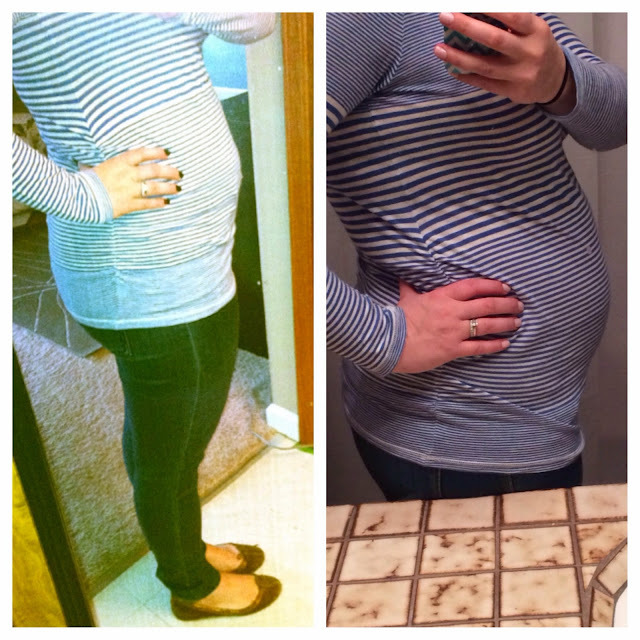 Here's my 16 week pic from Lily (on left) and baby wright #2 (on right). Same shirt and awkward selfie. Hello bump!